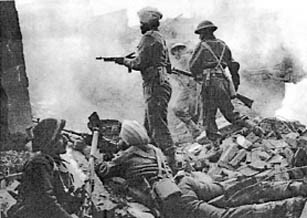 DURING World Wars 1 and 11, 83,055 Sikh soldiers laid down their lives, and 1,09,045 were wounded while fighting as part of British Indian Army. All of them wore turbans without exception, refusing to wear steel helmets, despite the protection these offered. Nothing could make them wear helmets. When ordered to do so, the Sikhs disobeyed, which often meant "collective insubordination — mutiny", with serious consequences. The intensity of war also could not lure them to wear helmets. During World War 1 in 1915, 14th Sikh was involved in intense hand-to-hand fighting at Gallipoli in Turkey. The battalion lost 371 officers and soldiers. The Sikhs refused to give up even an inch of ground. The enemy trenches were found blocked with the bodies of turbaned Sikhs, who died while fighting at close quarters. One of the important cases of refusing to wear helmets, or even to carry these, was related to Sikhs of the 25th MT Coy of RIASC (present day ASC — Army Supply Corps), forming part of the 4th Indian Division. This unit moved from Meerut to Egypt as soon as the war started. After their arrival in Egypt, troops, including Sikhs, were issued steel helmets, and were ordered to wear these instead of turbans, as they offered better protection against head injuries. Sikhs found a good cause in disobeying orders to wear helmets. They refused to touch helmets, and kicked them in the presence of British officers. Hindus and Muslims could not join the Sikhs in this revolt. Major Shirton, the Commanding Officer of the company, was determined to teach the Sikhs a lesson, and make them wear helmets instead of turbans; it became a prestige issue for him. He tried all methods to convince the Sikhs to wear helmets. When he failed, he threatened them with dire consequences by reading the relevant orders on disobeying a lawful command, especially during war; the punishment could be death. All officers in the chain of command addressed Sikhs, including the Brigade and Divisional Commander, but no one could convince the Sikhs, who were willing to be shot dead, rather than wear helmets. At one time Major Shirton brought armed soldiers, who aimed at the agitating Sikhs, and threatened to shoot them if they continued activities like disobeying orders and shouting slogans against the British Government. The Sikhs challenged him to open fire. It was obviously a ploy to threaten the weak ones. The British knew that any shooting at this crucial stage of the war would spread the mutiny in many other units. Ultimately, the British tried their old trick to break the unity by segregating the soldiers on the basis of religion. The Sikhs, Muslims and Hindus were shifted to different barracks. Most of the Sikh soldiers were educated; they argued their case with senior officers logically to make them see reason. They argued that turbans offered as good a protection as helmets from artillery shells and aerial bombardment, if not better. No other headgear could take proper care of hair, which is sacred to a Sikh. Sikh history is full of examples where Sikhs have sacrificed their lives for the sake of the turban. "You may take off my head, not my turban." The Sikhs concluded their arguments with a tone of finality. "For Sikhs, the turban was made mandatory by Guru Gobind Singh, who singularly excluded wearing of any other headgear except the turban." The summary court marshal tried 58 Sikhs in December, 1939, at Egypt. Even at this stage, before promulgating the sentence, it was announced that all those who go back to their work will be forgiven for their mistake, will not be punished, and no harm will be done to their careers. No Sikh was willing to stop the turban agitation, and stood steadfast. "No helmets, death acceptable." Beside the RIASC mutiny, there were many such rebellions over the controversy of turban vs helmets. The pattern followed by the mutineers as well the military authorities was almost similar to the RIASC mutiny. The 31st Battalion of the Punjab Regiment moved from Jhansi for operations in Egypt. After two months of training in desert warfare, the battalion was ready for operations. Subedar Ujjagar Singh of Pattu Hira Singh (Ferozepore), along with his company comprising of Doaba Sikhs, refused to wear steel helmets. However, the Sikh company did a splendid job, capturing hundreds of Italian prisoners with negligible causalities to turbaned Sikhs. Yet in another case, Sikhs of the 12th heavy regiment of the Royal Artillery Hong Kong Battery, and some Sikhs of the Hong Kong Garrison refused to wear steel helmets, and were charged with mutiny. A military court marshal sentenced them to seven years’ penal servitude in 1941. All 200 Sikh soldier prisoners at the cellular jail refused to wear helmets while rehearsing precautions against expected Japanese air raids at Andaman Islands. These mutineers were extremely defiant and were punished with lashes, flogging and deprivations. Yet, no Sikh soldier wore a helmet. Alarmed at the number of incidents, many senior British officers, who had served with the Sikhs, started to educate British young officers on the turban issue, supporting the Sikhs for not wearing helmets. Consequently, by the middle of 1942, orders were passed not to force Sikh soldiers to wear helmets. Turban is an article of faith that has been made mandatory by the founders of Sikhism, having immense spiritual as well as temporal significance, increasing a commitment to Sikhism, making a Sikh a more disciplined and virtuous person. It is a symbol of courage, self-respect, dedication, piety and sovereignty. It is intertwined with Sikh identity. Anyone who orders a Sikh soldier to take off his turban and wear a steel helmet just because it offers better protection to his head, clearly does not understand the Sikh’s psyche, and his attachment to his turban.